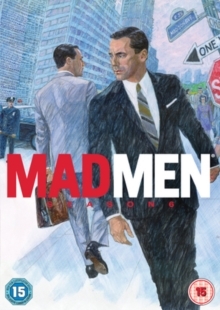 All 13 episodes from the sixth season of the Golden Globe-winning drama set in a prestigious advertising agency in 1960s New York, where sexism is a way of life and everyone smokes like a chimney. In this highly competitive, all white, male-dominated environment, the indefatigable Don Draper (Jon Hamm) is the top ad executive, but there are plenty of young guns eager to topple him from his perch. In this season, amidst the turmoil of the assassinations of Dr. Martin Luther King and Bobby Kennedy, Don proposes that SCDP merge with rivals Cutler Gleason and Chaough in order to win the Chevrolet account. The episodes are: 'The Doorway: Part 1', 'The Doorway: Part 2', 'Collaborators', 'To Have and to Hold', 'The Flood', 'For Immediate Release', 'Man With a Plan', 'The Crash', 'The Better Half', 'A Tale of Two Cities', 'Favors', 'The Quality of Mercy' and 'In Care Of'.